Grows small but packs a lot of color. Got huge last year. They were planted and bought for an area around my pond and they are doing nicely and filling in with color. They look amazing. Arrived on time & well pkd. The space they are to be planted is currently occupied by grass, but I have plans to de-sod the entire yard & plant it with azaleas, lilies & other perennials. 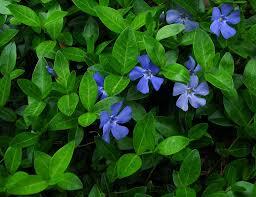 Vinca Minor Periwinkle is excellent for steep hills or sloping areas where soil erosion is an issue. This vine is also perfect for planting under garden plants to keep weeds from overgrowing the plants. No other vine is quite like the minor vinca vine. It's a slower grower, and it is not invasive but can cover and the area in a couple growing seasons, It also is an evergreen vine with delicate lavender flowers in early spring. It can also tolerate drought and live well in standing water. Have you ever heard of creeping myrtle? What about periwinkle? Or perhaps just myrtle vines? All is the vinca minor. In southern states, its also know as graveyard vines because it enjoys the sloppy hill surrounding sites where there are little traffic and movement around them. Vinca Minors are lush and glossy with a nice color in spring and summer. The best part about these vines is their ability to choke out other weeds due to them having quite a mass of fiber roots. These vines always create a very gorgeous and spectacular ground cover as they grow in all areas. They can also survive if planted in large containers to decorate porches, patios and even pool areas during the summer months. These groundcovers are simple and easy to grow and cover all gardens in bright and brilliant color as they provide beautiful blooms. 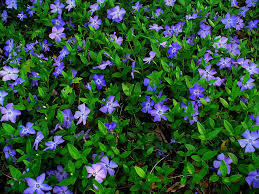 Vinca Minor (also known as periwinkle, dwarf periwinkle, myrtle, and creeping myrtle) is a flowering species originating in parts of Europe and southwestern Asia. This trailing subshrub provides excellent ground cover, and is remarkably hardy, with waxy hunter-green leaves and trumpet-shaped violet blossoms. The leaves are evergreen, while the flowers bloom from early spring through autumn. It is rarely disturbed by either pests, disease or weather, and is known to be deer-resistant.In the American south, Vinca Minor was often chosen for grave sites because of their long-lasting qualities. Even today, loyal bunches of this beautiful plant usually indicate forgotten sites, long after the original marker has disappeared. 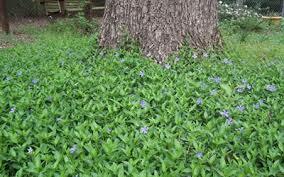 Vinca Minor thrives in partial sun or shaded areas.